Putin stresses Russia's historical claim to eastern Ukraine in televised Q&A. 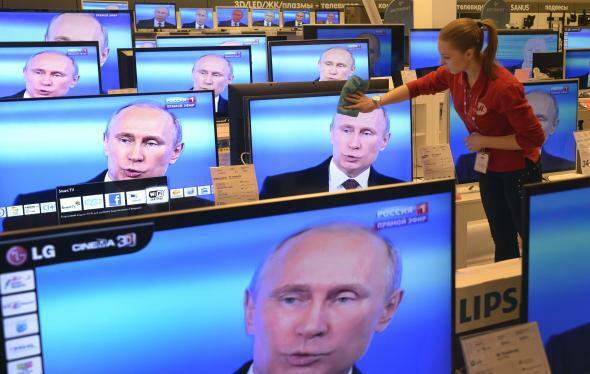 An employee wipes a TV screen in a shop in Moscow, on April 17, 2014, during the broadcast of President Vladimir Putin’s televised question-and-answer session with the nation. Russian President Vladimir Putin held one of his annual televised Q&A sessions today, in which he spends a few hours taking preselected calls from viewers. This time, the callers included one Mr. Edward Snowden, a recent arrival in Russia. Obviously, the president also addressed the ongoing situation in Ukraine. From an outside perspective, an end result of the crisis in which Russia maintains significant political leverage in a unified Ukraine seems like a better result than a costly intervention that inflicts further damage on the fragile Russian economy and likely results in Russian soldiers coming home in body bags. But, his calculus may be different if he views the current chaos as a once-in-a-generation opportunity to restore lost territory to Russia. From that perspective, his remarks on Ukraine today were not encouraging. This situation may have started with a major geopolitical setback for Russia, but now the president may view it as an opportunity to reverse what he sees as a historical wrong committed against Russia during the breakup of the Soviet Union. With the violence only worsening on the ground in eastern Ukraine, the prospects for this all being resolved soon don’t seem great today.